The ‘biggest carnival in the North of England’ is this year running from Saturday 24th June to Sunday 2nd July 2017. The Bakewell Carnival is an annual event in mid summer, held in the popular Derbyshire town of Bakewell in the heart of the Peak District National Park. This historic market town promises a week of events and festivities including a large procession, music and dance and even races. The blessing of the wells is an ancient custom, unique to Derbyshire, that is shrouded in mystery. Wells are ‘dressed’ with intricate, handmade designs, usually created from natural materials such as petals and leaves which are positioned and set into clay. These large images are supported on frames and propped above wells and springs as a type of decoration. They often depict different scenes and can get really intricate. Image: A well dressing from a few years ago depicting a biblical scene. © Copyright David Hillas via Geograph and licensed for reuse. There are a number of speculative stories explaining the origins of ‘well-dressing’. Some think it was once a pagan ritual carried through to modern times, or that it came across with the Romans, who arrived in Derbyshire during the first century CE, and that their dressing of the wells was a way of giving thanks for the abundant clean water springs they found in the county. A further theory suggests it wasn’t until medieval times, after the Black Death, that inhabitants started celebrating the purity of the local water supply by creating colourful designs. Whichever way the tradition stated, it is one that has stuck. Historically the well dressing takes place on the first Sunday of the festival but you can sometimes see the designs in the making before the they’re put on display. 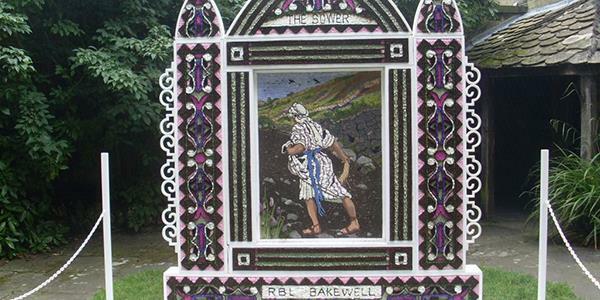 Different villages in Derbyshire will have their own well-dressing events taking place at various times throughout the spring and summer, but the Bakewell festival always has a really good vibe so if you’re at Blore, why not check it out? Bakewell is just over half an hour north of Blore Hall, up the A515. Find out how to stay at Blore Hall in the Peak District by entering your details at the bottom of the page.